Editor’s Note: Appraiser Phil Spool shows how an effective engagement letter puts you in control of an assignment. Now that many of you are searching for new non-lender clients in the aftermath of the mortgage crisis and HVCC (Home Valuation Code of Conduct), it is advisable not to lose sight of good business practices; one of the best is ensuring that you have a good engagement letter in place. Appraisal management companies (AMCs) and most lender clients require their own engagement letters but for non-lender clients, an effective engagement letter allows you to control the assignment rather than the client. Would you quote an appraisal fee without first finding out what type of property it is: single family residence, duplex, commercial property or vacant land? Or without determining who it is for and why is it needed? Will you be required to testify in court? Where is it located and when is the report due? All of these questions are very important and need to be answered before you can quote a fee and the answers need to be in writing. Quoting a fee is one thing, how you are going to get paid is another. This is why an engagement letter is necessary. Why do you need an engagement letter? To answer this question, one must generally understand the purpose of an engagement letter. In essence, an engagement letter is a legal document that defines the engagement between you and your client. This letter should state the terms and conditions of the engagement, address the scope of the assignment and the terms of your compensation. In a nutshell, you want your client to be in agreement about what is planned and expected in your appraisal report and how and when you are going to get paid. While each engagement letter may vary depending on the complexity or level of service you are providing, the following are some of the more important provisions needed in your engagement letter. The first four discussed are indicated in Standards Rule 1 and Standards Rule 2 in the Uniform Standards of Professional Appraisal Practice (USPAP). Type of report to be prepared (SR 2-2). Find out what your client needs in terms of the depth of your report. Perhaps the client is only interested in buying or selling the property and is the only intended user of the report. In that situation, perhaps only a Restricted Use appraisal report is needed. If the client wants a residential appraisal report and wants it on one of the forms, then it will be considered a Summary Appraisal Report. Remember, if the intended use is not for a mortgage transaction and a Fannie Mae form is used, you cannot use the current 1004 or 1073 form because the intended use is already stated, which is for a mortgage finance transaction. Some clients need more detail in the report, perhaps for litigation purposes. In this situation, a Self-Contained appraisal report might be in order. Remember, your fee might be based on the time you spend not only on your research but also in preparing your report. So if you are preparing a Self-Contained appraisal report, you should consider a higher fee than if you are preparing a Summary or a Restricted Use appraisal report. Indicating the name of your client is a must. If there are other intended users, they should also be listed. The same applies to including the intended use in the engagement letter. Remember, the intended use is not the same as the purpose of the appraisal. Typically, the purpose of the appraisal is the type of value. You might want to consider attaching the definition of whatever type of value is to be determined. Most appraisals determine market value. However, your client may request a value in use or an insurable value. State the property interest to be valued [SR 1-2 (e) (ii)]. If you are appraising a single family residence or an individual condominium unit, then more than likely you will be appraising the “fee simple” interest of the property. If you are appraising a commercial property with a long-term tenant or a multiple tenant building with long term leases, then more than likely you will be appraising the “leased fee interest.” State in your engagement letter that you are appraising the “fee simple” interest or “leased fee” interest so that there is no misunderstanding if you will be utilizing market rent (for fee simple value) or contract rent (for leased fee value). This may be further expanded in your brief description of the Scope of Work. Identify any extraordinary assumptions and/or hypothetical conditions. An extraordinary assumption is an assumption if found to be false, could alter the appraiser’s opinions or conclusions. A hypothetical condition is something which is contrary to what exists but is supposed for the purpose of analysis. So if you are doing an appraisal that might require an extraordinary assumption or hypothetical condition, state it. For example, if you are appraising a proposed improvement, such as a proposed house, then you will have the hypothetical condition assuming that the improvements will be completed. If you are appraising a property with a retrospective market value, you will probably have the extraordinary assumption that the condition of the property as of the effective date of appraisal was the same as the date of visit. Briefly describe your scope of work. This is very important. You should determine the scope of work or scope of assignment in relation to your client’s understanding and expectations. State the approaches you will use to arrive at your opinion of value. Be brief but give enough information so that when the appraisal report is completed and sent to the client, the client is not surprised by something you did not do. An example would be to exclude an approach to value that could be considered appropriate but the utilization of another approach or approaches would be sufficient to arrive at a credible assignment result. State the agreed compensation amount for your appraisal assignment other than depositions and/or court testimony. It is very important that you and your client are in agreement with the terms of your compensation. Be sure to include your fee for the assignment, retainer and when the balance is due. Indicate who is responsible for payment and that they understand they are financially responsible for the payment. Also, indicate that a fee for court testimony is separate from the appraisal fee. You might want to consider including a late fee charge if payment is not received in the agreed amount of time. If you are taking on this assignment with the full knowledge of a possible testimony in a deposition and/or court, then state your fee terms, including travel time, preparation work time and fee when arriving at the deposition or court. You might request a flat hourly rate, referred to as “portal to portal” or structure your rates in various categories, such as travel time to and from the deposition and/or court, telephone calls, preparation (review of your work product prior to a deposition and/or court testimony) and fee once you arrive at the venue (attorney’s office for a deposition or court for the trial). Regardless of who deposes you or calls you to testify, state in your engagement letter that the engaging party is ultimately responsible for payment. State the anticipated delivery date of the appraisal report and the method of delivery. Include the delivery date of the appraisal report and how the appraisal report is to be delivered, such as via regular mail or by email. Your signature and that of the client at the bottom of the engagement letter. Make sure you have space at the bottom of your engagement letter for your signature and date. Print the client’s name and indicate that the client has to sign above the printed name and that they date the engagement letter when they sign it. An additional clause to be considered is: “This appraiser is bound by current Uniform Standards of Professional Appraisal Practice (USPAP) guidelines.” This would cover many of the items mentioned above as well as any potential misunderstandings with the client, especially regarding the reporting of a predetermined result, a direction in assignment results, the amount of a value opinion and the occurrence of a subsequent event directly related to the appraiser’s opinion and specific to the assignment’s purpose, all of which are stated in the Management portion of the Ethics Rule in USPAP. Also, the 2010-2011 USPAP added a new item in the Ethics Rule requiring the appraiser to disclose, prior to accepting an assignment, any services regarding the subject property performed by the appraiser within the prior three years, as an appraiser or in any other capacity. Therefore, if you have not performed any services on the property you intend to appraise, include the following statement or something similar: “I have not performed any services regarding the subject property within the prior three years, as an appraiser or in any other capacity.” If you have performed some form of service on the subject property, then disclose it. In conclusion, I suggest that you confer with an attorney in drafting an engagement letter you feel comfortable with. 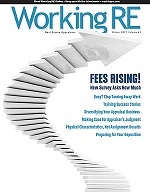 My article reflects my opinion what you, the appraiser, should consider when contracting with your client. Philip G. Spool, ASA, is a State-Certified General Real Estate Appraiser in Florida, appraising since 1973. Formerly the Chief Appraiser of Flagler Federal Savings and Loan Association, he has been self-employed for the past 18 years. In addition to appraising, he is an instructor with Miami Dade College, teaching appraisal courses and continuing education. He is Vice President and Chairman of real estate programs with the Greater Miami Chapter of the American Society of Appraisers. He can be reached at pgspool@bellsouth.net.